This meat pie is a variation on a dish my grandmother used to make. It is one loved by all my family. We call it “empanadas árabes.” The variation is that empanadas are usually a single serving small meat pie. 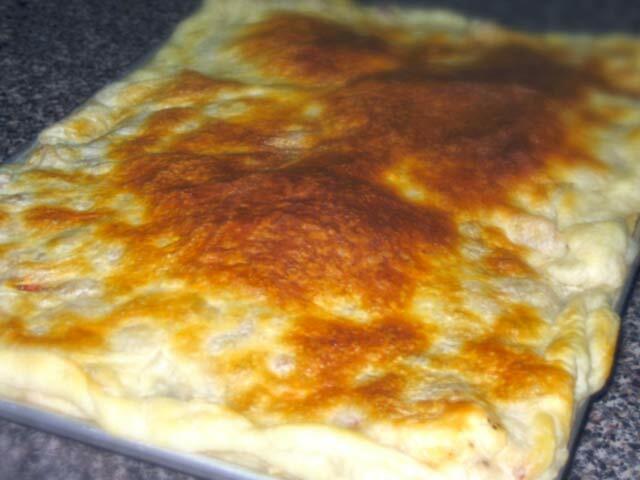 I prefer to make a large meat pie which tastes the same and it is easier to serve. The filling consists on ground beef being sautéd to golden brown to intensify the flavor, and then cooked over tomatoes, caramelized onions, and white wine. It is the white wine that gives this dish its special taste and aroma. It all goes inside a flaky dough crust and sent in to the oven to bake. Even though it is very hot in the summer to do this kind of baking, the taste of the dish is worth it. Dedicated to the loving memory of my Grandmother Salma. The basic recipe would be nice.